Homeowners know how tough it is to keep floors clean. We often do not realize how our constant treading drags a lot of grime and dirt from outside into the house. This makes the floors dirty and stained. Such dirt cannot be cleaned by traditional means. Even if you choose to use acid on the floors, you won't be able to clean them as effectively as we can at Superior Cleaning and Restoration Inc. We are one of the leading providers of tile and grout cleaning in Solana Beach. No matter how dirty your floors are, we can clean them for you. A lot of people don’t understand the importance of getting their tiles cleaned professionally. Our tile and grout cleaning service will keep your tile looking great for years. 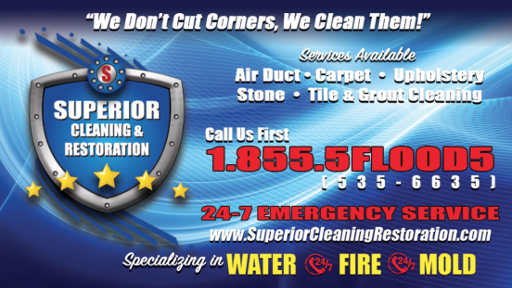 Superior Cleaning & Restoration Inc. employs a cleaning system that is truck mounted and one of the safest and the most effective ways to clean floors, countertops and showers. We use cleaning technology and equipment specifically tailored to clean tile and grout. The equipment and products we use make it capable of producing results that no other equipment and products can. The experts at Superior Cleaning and Restoration Inc. use a specially manufactured cleaning agent that will get rid the dirt and the grime without damaging the tiles or making them look bad, the way acid does. Our techniques and methodology is safe and produces effective results. We are known in Solano Beach for effective cleaning services. We will clean the floors, get rid of all the dirt and damage and we we’ll provide a special finishing touch that prevents any future discoloration as well! All you have to do is give us a call and setup an appointment!